Former Eastern Province Chief Minister Sivanesathurai Chandrakanthan alias Pillayan was arrested by the Criminal Investigation Department short while ago when he arrived at the CID office in Colombo this evening to give a statement, police media said. 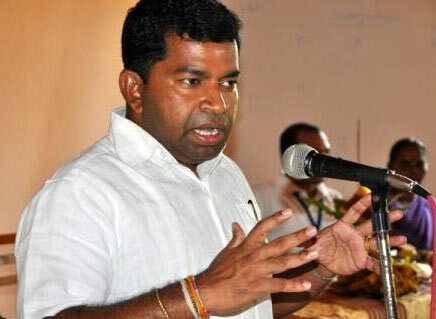 He was summoned by the CID to record a statement in connection with the killing of former TNA parliamentarian Joseph Pararajasingham who was shot dead on December 25, 2005 in Batticaloa. Now starts with the soft targets Pillayan, next Karuna, next Douglas, next Kudu Dum*nda to condition the general population, followed with big fish Yo***tha for eliminating ruggerite Thajudeen, next thug Go** for eliminating Lasantha etc etc. by which time supporters of MR & Co would be softened and conditioned enough so as not to create hell once again in mother lanka. On the side of robbing the country it is a healthy sign to have started with Na**l with the $500millian still left from the initial $1000 million in Dubai then for the balance $500million then the previous big boss with only god knowing with how much etc etc provided Saj*n does not get bumped off before then. Now that they have already started with the big fish all small fish might be either cringing for their turn to come or elated that they are getting away as their total haul is insignificant compared to that of the big fish and that the authorities will be too tired to come after them. Good, but will be released on bail. First he will be admitted to hospital and then released. Nothing will happen, if Pillayan starts talking there will be more to be arrested and all the hospitals will be full.